I was out last night and didn't get to see the show until now, so we're a day late on the recap. 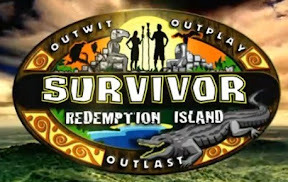 Team Russell won immunity again, while Farmer Ralph pulled an immunity idol out of a tree stump without a clue. Rob concocted an elaborate feint at Tribal Council to vote out Matt while pretending to vote out others. Kristina played her immunity idol to keep herself in the game. Rob's plan worked and Matt got blindsided out, separating him from his cute female friend, Andrea.